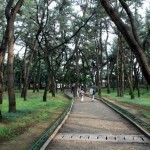 From the Seokguram Grotto we headed back into town and strolled through Tumuli Park. 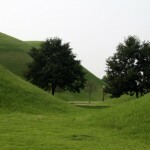 The tumulis are grassy hills that enclose tombs built for the Shilla monarchs in the 5th century AD. 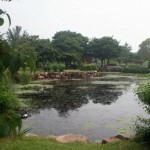 It’s a very pleasant park, with lots of trees, and some small ponds. 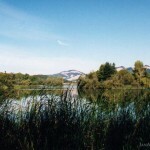 All the paths are clearly marked, and there’s piped in music to complete the experience. 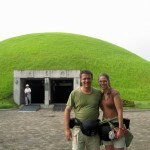 One of the tombs, Cheonmachong, is open to the public and you can go inside and see how the tombs were made and see replicas of the treasures they found inside (the real things are now at the museum which is closed Monday 🙁 ). 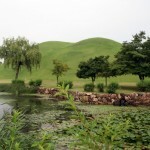 I hope you don’t mind answering some questions regarding Gyeongju…I plan on visiting the following sites: Tumuli Park, Wolseong Park and Cheomseongdae Observatory. Do you think this is doable in under 3 hours? I will just be walking from one point to another. Can you please give me an estimate on how far each of these sites are from one another? Hope to receive a reply soon! Thanks so much!